At Aerodry it is our constant endeavor to provide best quality products and services with technological innovations and continuous development for the total customer. At Aerodry, we ensure stage wise and final functional/performance tests to ensure zero defects in the end products. 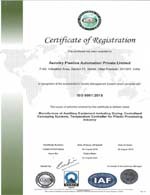 The company is an ISO 9001:2000 and CE certified organization making it a global player in terms of quality and performance.